NAZARETH, Israel (CNN) -- Israeli Prime Minister Benjamin Netanyahu urged Pope Benedict XVI on Thursday to use his moral authority to thwart anti-Semitic sentiment and hatred toward Israel, especially by Iran. 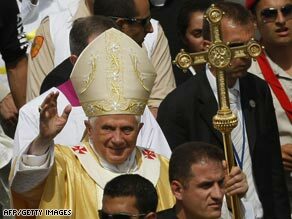 Pope Benedict XVI arrives to celebrate Mass in Nazareth, the boyhood town of Jesus, on Thursday. In private talks, Netanyahu expressed concern about the lack of outrage over comments made by Iranian President Mahmoud Ahmadinejad, who often denounces Israel. On several occasions, Ahmadinejad has has called for an end to Israel's existence as a Jewish state and questioned whether the Holocaust, in which 6 million Jews perished, occurred. "I implored him from a humane point of view to make his voice heard loud and clear against the rhetoric coming out of Iran to destroy the state of Israel," Netanyahu told the Israeli Broadcasting Authority after the closed-door meeting. The highly anticipated talks between Benedict and Netanyahu could have been tense one day after the pope publicly endorsed a two-state solution to the Middle East crisis. In a Wednesday speech attended by Palestinian Authority President Mahmoud Abbas, Benedict assured Palestinians of the Vatican's support of a sovereign Palestinian homeland. That's a concept that Netanyahu, leader of the hawkish Likud Party, resists. But Thursday's discussion instead centered on anti-Israel rhetoric and the plight of the small Christian minority living under Hamas rule in the Gaza Strip. During the Mass, Benedict brought a message of reconciliation to about 20,000 parishioners gathered at the Mount of the Transfiguration, outside Nazareth. Greeted by a jubilant crowd waving Vatican flags, the pope smiled broadly and waved as he entered the amphitheater Thursday. Many pushed closer to snap a picture of Benedict as he passed by in the back of the so-called pope mobile -- a modified truck that is covered by bulletproof glass. But a local controversy caught the Vatican's attention and was included in the pontiff's homily. "Sadly, as the world knows, Nazareth has experienced tensions in recent years which have harmed relations between its Christian and Muslim communities," Benedict said. Tempers have flared during the past decade over the planned construction of a mosque near the Church of the Annunciation, which stands at the site where Catholics believe the angel Gabriel told Mary that she would conceive and give birth to Jesus. "I urge people of good will in both communities to repair the damage that has been done, and in fidelity to our common belief in one God, the father of the human family, to work to build bridges and find the way to a peaceful coexistence," the pope said. Benedict's trip marks his first papal visit to some of Christianity's most holy places since Pope John Paul II made the pilgrimage in 2000. He returns to the Vatican on Friday.